Seven often wet and muddy researchers can be found bundled in their orange full-body suits sifting through mud on the back deck of the Healy. They are investigating areas considered biological “hotspots” – or areas of high productivity – in the Pacific Arctic Sector, as part of a program called the Distributed Biological Observatory or DBO. The DBO grew from an international recognition that collecting standard samples by the many ships passing through the Bering Strait region could help map ecosystems in transition. On board the Healy this August, scientists are adding information to a decade’s worth of documenting how life in the sediment of the Arctic is changing as waters warm. Until this year, a particular species of cockle clam was consistently observed in one of the more southern biological hotspots. “Where we were pulling up twenty in previous years, this year we pulled up one,” said Christina Goethel, a doctoral student at the University of Maryland. Scientists are not yet certain of what caused this change but it is not surprising that as the warmer waters move northward, the seafloor marine life that typically thrives in cooler waters recedes and sometimes dies. The changing ecosystem affects other organisms higher in the food chain, like walruses that eat the cockles, which eventually affects local Alaska communities that depend on subsistence foods harvested from the ocean. Grebmeier with her colleague and husband, Dr. Lee Cooper, have conducted more than 30 years of research to ensure regular sampling of the seafloor marine life community of the Arctic. They were instrumental in establishing the DBO, which is now an international scientific program, and continue to contribute to its ever growing database of information. 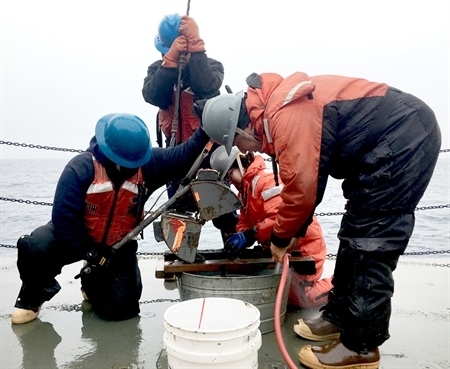 Recently, Cooper and Grebmeier have begun incorporating video camera technology to supplement mud sampling and are exploring ways to get help from citizen scientists to analyze the footage captured of the Arctic seafloor.